Imagine that you’re with your friends, family or significant other on a weekend afternoon or night. You’re looking for place to eat where you don’t have to wait long. You’re starving and.want instant gratification. You can opt for fast food. Most people do. But why settle for greasy mediocrity when you can have great local taste? This week, we’ll take a look at two Newington Hole In The Walls that offer just that. Atmosphere: 9/10- When you enter this brightly colored restaurant, you’ll be immersed by creativity. You might first notice some local faces hanging in picture frames on the wall. These are the winners of GoldBurgers’ food challenges. The “Big Dog” and “Trinity” challenges require contestants to finish a large amount of food in less than 45 minutes. You will also notice a specials board and a suggestion box. If you have a creative idea for a new menu item, you can submit it to the suggestion box. The GoldBurgers staff considers new items all the time. They could choose your idea and add it to the specials board! Service: 10/10- We’ve visited GoldBurgers several times since its opening in 2009 and we’ve always encountered friendly and fast service. The staff tries their best to make you feel at home and will often inquire about your day, local events and how your food tastes. This “hometown personality” cannot be replicated by a chain restaurant or some fast food joint. Price: 4/5- Revision 12/28/12: We did an inventory of burger places in Connecticut and discovered that GoldBurgers prices DO NOT border on the high side. 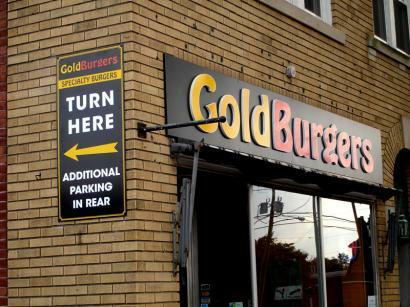 In fact, Goldburger’s prices are pretty competitive. This is why we changed the score to 4/5. 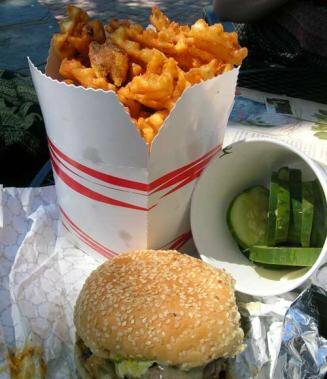 You can buy a solid meal (a burger, fries and a drink) for around $10. If you’re looking for an economical route, we suggest the “Build Your Own Burger” option. For $3.49 you can build a single patty burger with choice of a number of free toppings. You can even choose potato chips and banana peppers! For $4.99, you can build a double patty burger. 5. Fully Loaded Fries: Your choice of fresh cut fries or waffle fries topped with nacho cheese sauce, crumbled bacon, sour cream & jalapenos. $5.99. Add Chili for $1.00. Taste 9/10: Yes, GoldBurgers’ menu items taste as delicious as they sound. They’re juicy, freshly made and packed with plenty of flavor. In a nutshell: 37/40-GoldBurgers stands as one of the best burger joints in Connecticut because of its creative atmosphere, diverse menu and dishes that drip with flavor. We strongly recommend you stop by for a bite if you live in Hartford county or if you’re willing to make the trip. Service: 9/10– You’ll find humble and pleasant service at Tokyo Café. The staff greets and serves you with a quiet kindness. You won’t need to wait long for your meals or for a check. You can also order take-out style. Selection/price: 8/10- Tokyo Café has a diverse selection of items. When you scan the menu, you will find a unique selection of items that don’t exist at other local Japanese restaurants (i.e. Philadelphia Roll, Peanut Avocado Roll, Sweet Potato Roll). You can also order a select number of hibachi items. 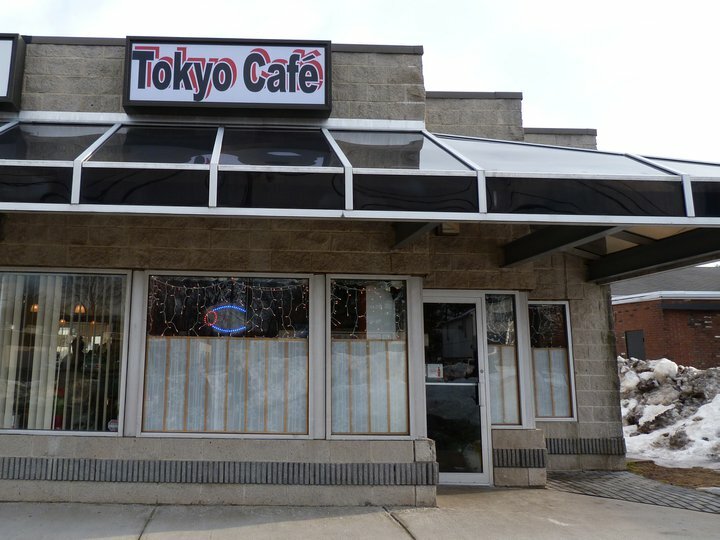 Tokyo Café is fairly priced for a sushi and hibachi restaurant. It could, however, benefit from an “all you can eat-sushi” option. Check out our five picks for Tokyo Café’s most creative menu items. For more information, check out the entire menu. 5. 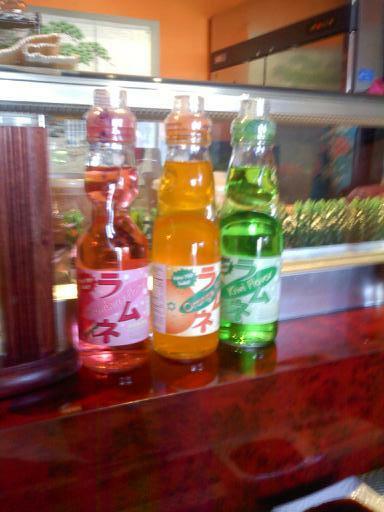 Authentic Japanese sodas: Flavors include-strawberry, orange, kiwi and mango. Taste: 9/10-Tokyo Café serves a fresh and delicious taste. Tokyo Café’s sushi dishes are not all together filling. If you are looking for a filling meal, we suggest you order one of the bento box options or the hibachi dishes.